I'm so glad it's Thursday! I am more than ready for the weekend. I have no definitive plans other than probably staying in the camper and riding my horse. Kinda bumed because to make a long story short I am probably looking for housing on my own now. My previous plans for an apartment next to the barn have fallen through. So I'm back to square 1. This weekend "G" has a truck competition on Saturday about an hr away and may be spending the night, but doubtful considering what the weather report is. Sunday is his birthday! dum dum dum! Just relax, take a deep breath. Things have actually been well and friendly between the 2 of us. He's confused about life in general and I am just starting to sort things out. We're on two different levels right now. Be we had a few heart to hearts and it was nice. Work is crazy busy and the weather is too nice right now, I could think of a million other places I could be. Wanted to end this post with a few pics. The bay mare is Moonshine, the horse I rode Sunday. 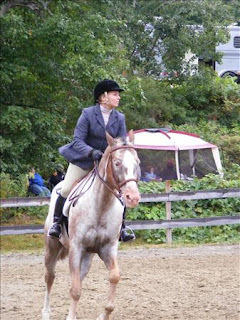 The picture was taken last fall, she is such a nice mare and has so much potential. And the other one ofcourse is of my appy. Have a great day everyone, and maybe I'll write more tonight. Probably only going to the barn for a few minutes to chat and then have to go home to let the dogs out and my dad asked me to help him put in some docks at the camp, yippee (not).